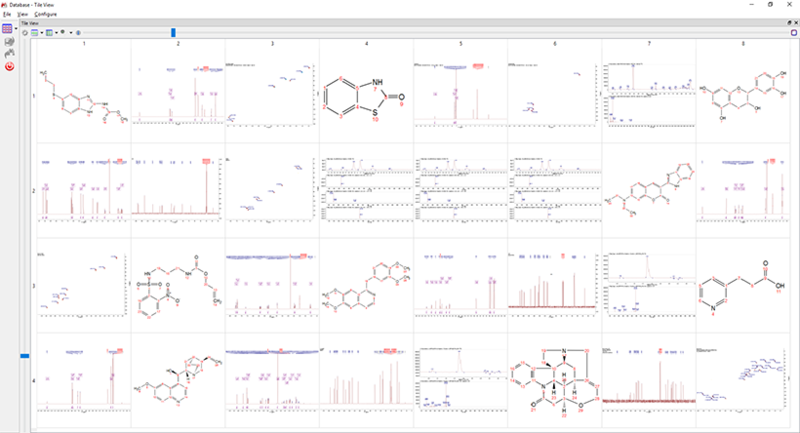 A professional database integrated within Mnova for the efficiently shared storage of molecular structures, NMR and LC-MS and GC-MS analytical data as well as other Mnova objects. Create new databases and safe records to them with a couple of clicks and run searches in many different ways: by structure or substructure, specific peak position, multiplets, and/or mass peaks etc. 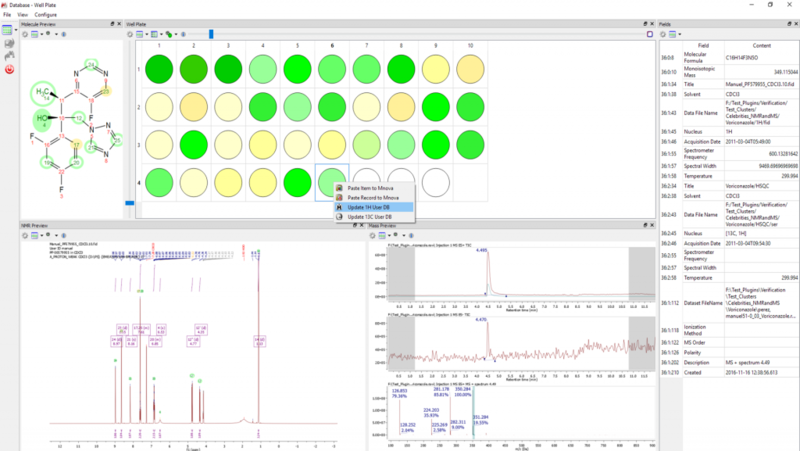 An effective multiplatform environment for the storage, indexing and searching of analytical chemistry data. Create new databases and save your analytical records to them in a few seconds. Browse and view reports in many different formats such as a table, a record, a well plate, HTML view, etc. Allows you to create user accounts with different privileges: administrator, power user and normal user. For individual users. Connections on a local computer, one click installation and no server license required. Mnova DB Client is included in Mnova. For group users. Accepts connections from anywhere, very easy installation and server license is required. For enterprise users with high needs. Runs on any DB backend, accept connections from anywhere and a server license is required. Mestrelab can provide you professional service to customize your Database via scripting. 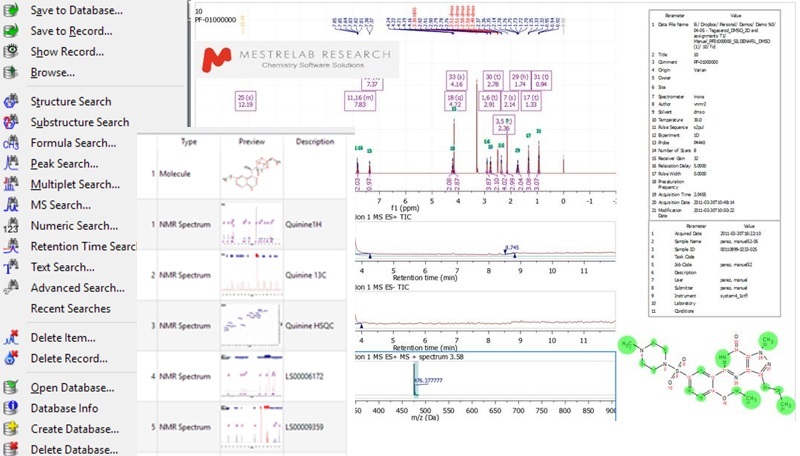 Mestrelab also offers tools and solutions which automatically add acquired spectra and other chemical data to the database for sharing or further processing. 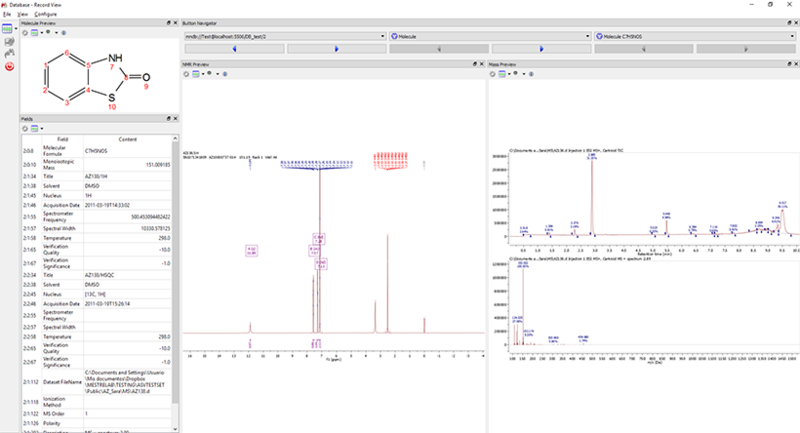 Wiley spectral library “1H and 13C NMR of Organic Compounds 2014″ is now integrated in Mnova DB. NIST Database is integrated in Mnova DB with over 250,000 MS records. Companies and research institutes typically have accumulated large amount of analytical data that are scattered around, and need to be better managed so they can be shared and searchable. Once that data is stored in the DB, it can be easily accessed by your chemist, by using Sample ID or Compound ID searches, or by running peak or Retention Time searches when working on unknowns. 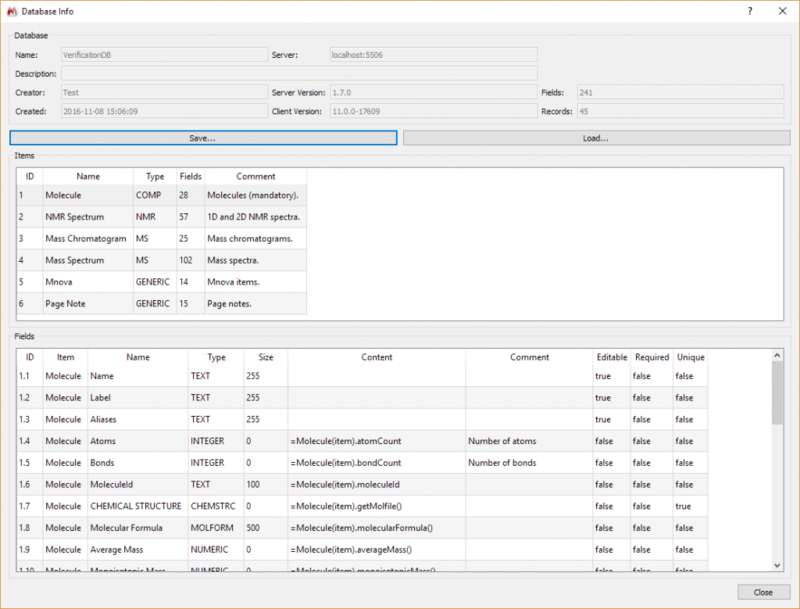 Mnova provides a set of scripts for you to populate multiple NMR and/or LC/GC/MS datasets to a database. For more complex cases, you can write your own scripts to combine the power of batch processing, analysis and databasing. 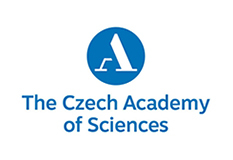 Chemists will be able to save their work to the Database, so that it can be easily found and retrieve by anyone with access later. 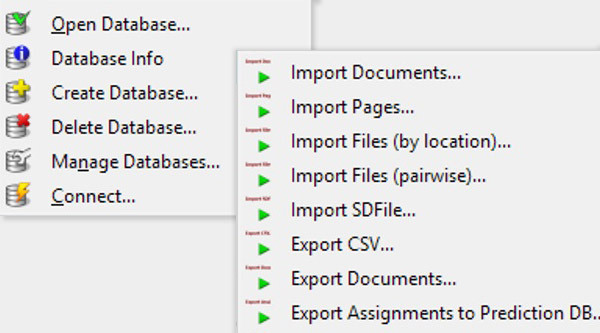 Mnova DB is integrated with Mnova Suite, so that you can save or search data conveniently during your workflow. 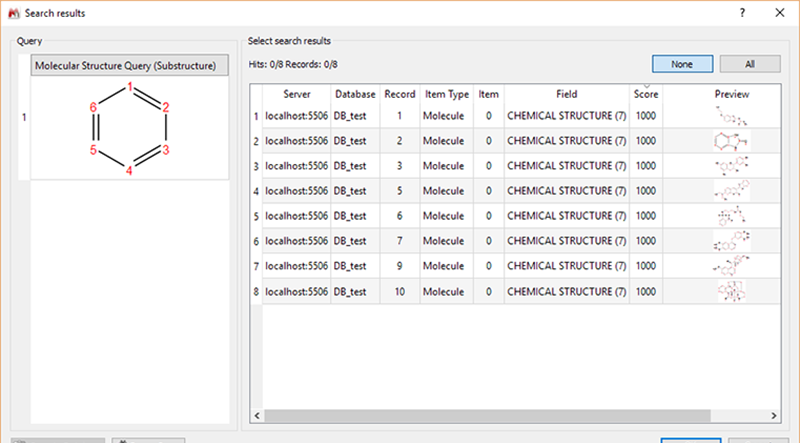 When you open an NMR and/or LC/GC/MS dataset in Mnova, you can save such data into a chosen database at any stage. This can be your raw data, parameters, transformed data, analysis results, annotations, and even attached objects (such as an embedded PDF or Word document). Mnova DB allows you to combine any of the queries listed above, using logic and or operators, this is useful when you need to refine your search results iteratively. Mnova DB also save the results into a temporary database and continue to search to refine it. It provides is a very flexible module where the customization option is available. We can use automation to set up the DB in such a way that data will be automatically imported into it when acquired by your instruments. Your chemists will no longer have to navigate through folders in the file system to get at the data in order to review it or analyze it. They will be able to retrieve the data directly from within Mnova, by running Sample ID, Sample Number, Compound ID or structure searches. This will save your chemistry group a lot of time and significantly increase productivity. Pharmaceutical, chemical and food industries among many others. 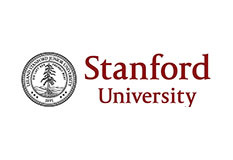 Academia Research and QC environments. Mnova DB is suitable for individual users, small research groups as well as large institutions.